Although those of us with declining eyesight might be holding out for larger-than-life-sized monitors, our students have embraced smaller-is-better as they pop their devices into their back pockets and backpacks. 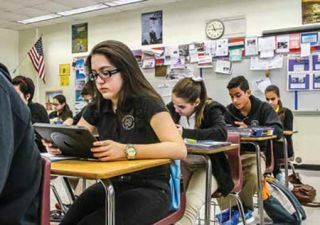 And so, in our effort to prepare our students for the increasingly mobile world they already inhabit, tablets may be the best choice of hardware purchase. But which tablets? Is there a magic formula to finding the one that your students and teachers will use? Let’s see what some of your colleagues have to say. What tablets are you using? HP Elite 900 for secondary students; HP 210 laptops for elementary students. Approximately 31,000: 5,000 for 7th-grade civics and 26,000 for 9th-grade U.S. history. How long have the students had them? The HP Elite 1000, which comes with Mericast capability. Any tips for finding the best tablet for your students? Best price and best fit for existing infrastructure (applications and operating systems). Take advantage of cases and gorilla glass, as well as local battery swapping. 225; 1:1 for grades 5-12. Since August 2014, but the school has been 1:1 since 1996. Teachers who were due for a new tablet received Surface Pro 3 tablets. Flexibility: It’s a full-powered laptop running a full OS that can be used as a laptop or tablet. It removes all constraints and allows us to fit the tool to the task—not the other way around. We have access to the desktop version of OneNote, which has been a game changer in terms of collaboration, engagement, and organization. They need a bumper case to prevent damage. Choose devices that allow for creativity and creation of content. You need to have pen, touch, and a keyboard. Decide on objectives and then choose devices that allow you to achieve them. Too many schools pick the devices first and then try to figure out how to use them. Between 3 and 4 years. Teachers have the same models, although we are starting to replace some with upgraded models to replenish our student swaps. Do not make it about the device. It should be about the learning. Too often, districts start with a device in mind and then try to make pedagogy and curriculum fit—based on what they choose. Think about what you want to do and a device that aligns with those ideals will naturally rise to the top. LearnPad XD (the 1st model). Approx. 540, one for every student. Since the beginning of the 2013-2014 school year. Every teacher has a LearnPad Quarto. We occasionally come across Web sites or apps that we wish we could put on the LearnPad, but we know in time they could become available. Find a device that will help you manage your classroom and design lessons that are specific to what the students are learning. Acer Iconia W510 and Acer Aspire Switch 11.6- inch tablets. Approximately 2,000 tablets (for the five schools participating in PARCC testing). Between 3 and 18 months. The teachers were provided with the same tablets. ❉ Space saver: When managing more than 9,000 devices, this is a big bonus. ❉ Battery life expectancy: It seems to be more in line with listed specs and battery longevity is better than laptops of old. ❉ Versatility: Our tablets came with detachable keyboards, which gives us the freedom to use them like a laptop when needed or to enjoy the true portability of a tablet. Life expectancy: With regular maintenance, we are accustomed to getting 5-7 years from our devices. It is more difficult to keep track of devices in this form factor. Deploying tablets requires much more planning and staff participation than desktops. All of our tech decisions have been a joint effort between the curriculum team, which identifies the need, and our technical team, which comes up with product suggestions. Typically, vendors are eager to lend or give discounted prices for a pilot, so take advantage of that opportunity and bring in several devices to kick the tires. We look for technical merit and whether the device fits our immediate and long-term needs. Dell Venue 11 Pro tablets (with Dell Slim Tablet Keyboards & Active Stylus pens). Since the start of the 2014-2015 school year. Some use the Dell Venue 11 tablets but most use the Dell XPS 13, which can be used as a laptop or a tablet. ❉ Form factor: It allows them to be truly mobile and—thanks to Office 365—enjoy 24/7 learning opportunities and collaboration. ❉ Exceptional battery life: A full charge allows the student to use it the entire school day without issues. ❉ Versatility/manageability: Tech staff can preload an image on it, complete with the necessary applications, and manage it through Active Directory Group Policies and push down and install additional applications if needed. With the corresponding dock, we can take full advantage of a two-screen experience. With a bit of imagination from the teacher or student, the tablets are adaptable for every single course. ❉ The glass touchscreen has a tendency to crack when it is stuffed into a backpack with a load of textbooks. We think uneven pressure from the textbooks against the glass screen is causing this. A raised or reinforced bevel or a protective case would fix this. ❉ It is imperative to keep the firmware current, and since firmware can’t be pushed down via management tools this means we have to eventually touch every single tablet. Choose the device that makes the most sense for the age group and circumstances of your situation. You must take into account: infrastructure, manageability and its cost, pedagogy, and peripherals. Put the devices under consideration into the hands of the people to whom it matters most: the students. My student assistants reviewed every single Windows 8 tablet for strengths, weaknesses, and relative costs of each. Samsung Galaxy Tab 4 Education tablets and 7-inch Samsung Galaxy Tab 4 tablets with a kid’s mode interface. More than 5,000 tablets for students and staff in grades PK through 12. We began the first phase in November 2014. The Samsung Galaxy Note 2014 edition, which has the Samsung S-Pen. Unpacking the mountains of boxes preparing the tablets for use by students, and—as with any technology—dealing with help desk issues. First look at your level of staffing and support. Certain devices/tablets require a greater level of support to manage and provision. But the driving force should always be transforming the learning environment. Create a vision for the learning environment you want for your students and let that be the measure in the search for the right device. ■ Adobe Voice is free and it gives the chance to children to use their pictures or their text and record their voices with music at the background. ■ Biscuit lets users create their own vocabulary list and includes definitions. ■ FriendStrip lets kids pick a story and personalize it with pictures and texts. ■ PicCollage lets students write and add props in a picture. ■ QR Code Scanner and Creator—Kids love it! ■ Tellagami helps you to create your own avatar, choose a background and record your voice for your animated avatar. ■ Videolicious is a great tool to create videos from your pictures, by adding music and your voice.